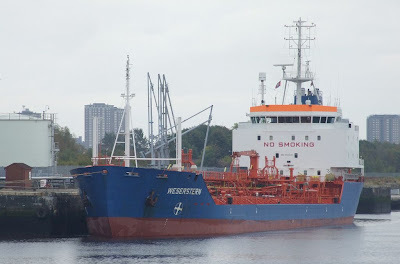 Closely following along after the Fisher tanker CLYDE FISHER today was this ship WESERSTERN, seen berthed in Rothesay Dock. Built in 1992 at the Wismar ship of MTW Schiffswerft GmbH, this ship was lengthened in 2001 to give her an overall length of 127.20 metres. Her deadweight tonnage is 10,932 tonnes, and her gross tonnage is 6,441 tons. Her owners are Rigel Schiffahrts GmbH, and she is now registered at Douglas, on the Isle of Man, although she originally flew the German flag.